A new space called the Think Tank opened in the College of Arts and Sciences on Monday, but the space may not be what you think. The Think Tank is not a policy or research institute — although it may be used for research papers — it’s a study room for CAS students to gather between classes, with both a lounge area and separate huddle rooms for students to break out and study. The grand opening ceremony was held from 11 a.m. to 12:30 p.m., and by noon the study rooms were already filling up. Signs of celebration like music, balloons and sandwich platters welcomed students, who were just days ahead of their finals study period. “We’re excited to continue to build community within CAS and give our CAS students a space that they can call their own to study, to hang out, to connect with each other and just really to take a break in between classes in the building they take a lot of their classes,” said Stacy Ulrich, director of Student Programs and Leadership. Ulrich said the Think Tank was a collaboration between the CAS dean, donors and CAS Student Government. CAS Dean Ann Cudd said she thinks the room turned out beautifully, while it will also be useful and functional. 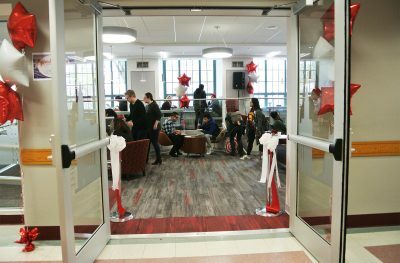 Cudd hopes students will gather in the Think Tank to study, work on group projects or even eat lunch and take a break between classes. Cudd added that often, students in CAS may not feel they have the same sense of belonging as students from smaller schools, but she hopes this will help to change that. “There are all kinds of communities that students belong to, but I think having this space will be very helpful for creating a community within the College of Arts and Sciences,” she said. Several CAS students agreed, saying that they were excited to have the additional space. Sophomore Jean Paul Vazquez said he has seen the Think Tank under construction for weeks now, but was lucky enough to notice on Boston University’s Snapchat story that it was opening on Monday. Freshman Ashley Azeez said she will definitely use the lounge in the future. “I personally love study spaces and you don’t really see that many study spaces on campus that are within colleges, so I was really excited when they opened this up,” Azeez said. What many students find during busy periods like finals week is that too often, campus study areas can be filled up pretty quickly. Senior Gavin Belok said he thinks spaces for students to gather are one thing BU is lacking.